Held every year during the UN General Assembly Week, the Social Good Summit brings together world leaders, entrepreneurs and community activists in one place to discuss solutions for the greatest challenges of our time, while opening the dialogue to a global audience. 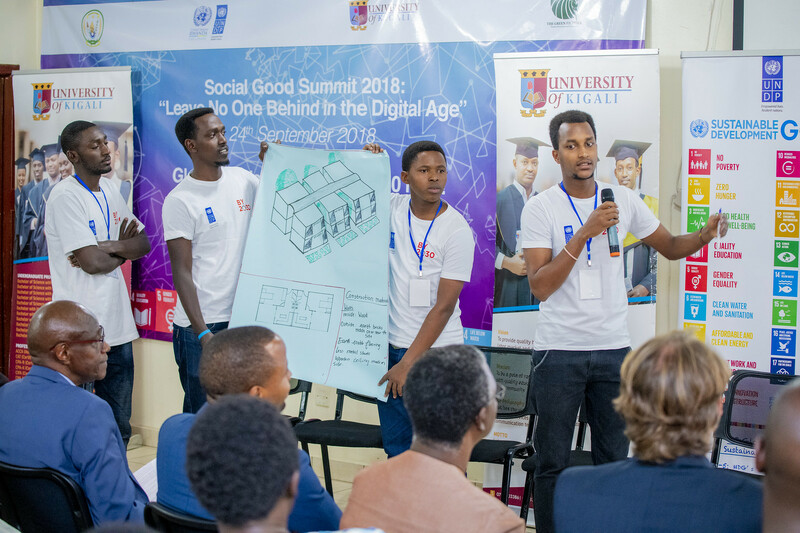 In Kigali, the 2018 Social Good Summit took place on the 24th of September 2018, and focused specifically on how we can unlock technology’s potential to make the world a better place with a focus on the digital inclusion of persons with disabilities. It was hosted at University of Kigali, and attended by close to 500 local students, as well as social entrepreneurs from across the country. Among the attendees were the Hon. Minister of ICT Jean de Dieu Rurangirwa; the head of UN Rwanda, One UN Resident Coordinator Mr. Fodé Ndiaye; the head of the World Bank Country Director of Rwanda, Mr. Yasser El-Gammal. As the guest of honor, the minister of ICT thanked the attendees of the event while also commending UNDP for organizing the event. He recognized technology as means to support people with disabilities in their day to day challenges, which also impact the country’s development. “Sustainable development is the key to empowering all people in the future of development efforts. Technology can be used to include everyone in development.” said Hon. Minister of ICT Jean de Dieu Rurangirwa in his remarks. The event was facilitated by UNDP Deputy Country Director, Ms. Roselyn Sinemani, asking questions regarding key themes and ideas to focus on while implementing the SDGs, from the perspective of persons with disabilities. It featured panel discussions with civil society organizations including the Rwandan National Union of the Deaf, the Rwandan Union of the Blind. Also, in attendance were envoys of the Ministries of Youth, and Local Government, as well as young social entrepreneurs from across Rwanda. 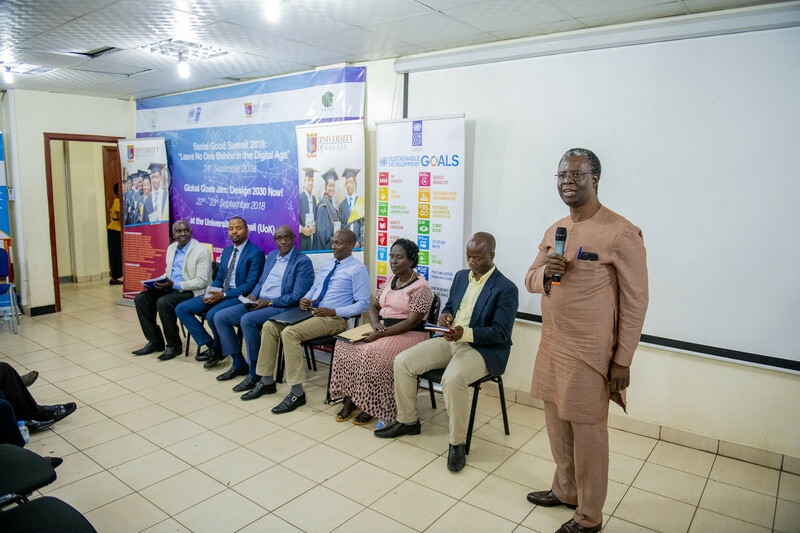 In conjunction with this year’s Social Good Summit, UNDP also hosted the Global Goals jam that took place on 22nd and 23rd of September 2018. The two-day event was aiming at engaging solution makers and designers to contribute to the sustainable development by creating short-term intervention with long term impact. 40 selected applicants from different backgrounds gathered at the University of Kigali to tackle challenges that were given to them. These challenges are 5 goals of the Sustainable Development Goals. These include Goal1 on No Poverty, Goal 3 on Good Health, Goal 5 on Gender Equality, Goal 7 on Affordable and Clean Energy and Goal 11 on Sustainable Cities and Communities. The outcome of the Jam was in turn presented during the Social Good Summit. During the event, Hon. Mister of ICT Jean de Dieu Rurangirwa agreed to participate in further roundtable discussions with representatives from the civil society organizations present to address some of these challenges. Namely, the Rwandan National Union of the Deaf and the Rwandan Union of the Blind. These future roundtables will be hosted and facilitated by UNDP Rwanda, and preparations for them are currently underway. To close the event, One UN Resident Coordinator Mr. Fodé Ndiaye reaffirmed the UN’s commitment to supporting efforts to leave no one behind. This includes One UN joint programmes on supporting Civil Society Organisations that advocate for the rights of the people with disabilities among others. The resident coordinator also called for stronger partnership to move forward the ‘Leave no One Behind Agenda’. “You walk out the door of this event, and you are energized! You have new ideas, new inspiration, to move forward as society.” - Fodé Ndiaye, One UN Resident Coordinator. This year marked the 9th edition of the Social Good Summit globally, but 7th edition in Rwanda. 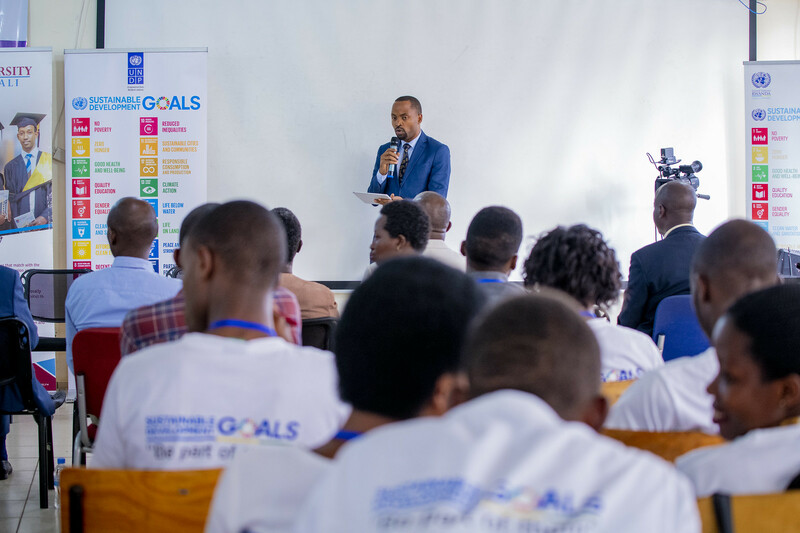 UNDP Rwanda hosted the 2018 local Summit with the theme ‘Leave No One Behind in the Digital Age’. In this digital age, technology is crucial in the development journey, be it in financial inclusion, health care, or public service. However, it has also been noticed that some groups of people have limited access to this technology, hence are not fully benefiting from its advantages. This includes people with disabilities, people living in rural areas, and women, to name a few.